Pushing the NCD Agenda, Dr. Joy St. John, Chief Medical Officer (CMO) in the Barbados Ministry of Health, has played an important leadership role globally, regionally and nationally within the context of NCD prevention and control. She has been a strong advocate for NCDs and has fought for for the establishment of regional and international NCD frameworks. 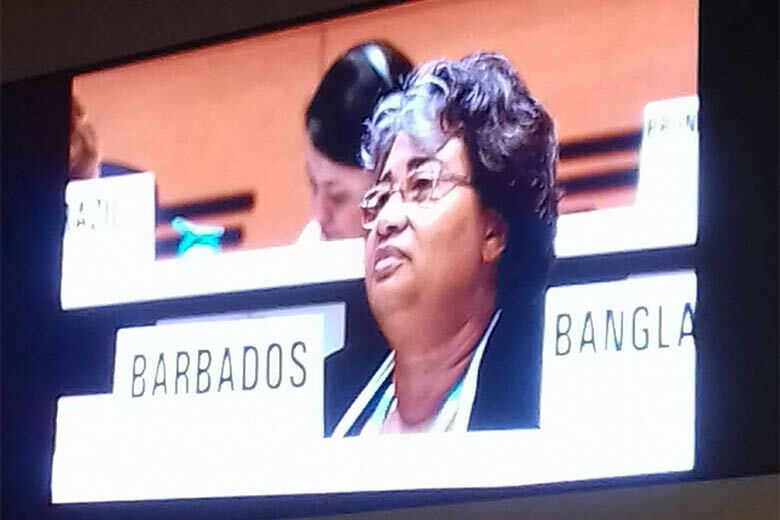 Most recently, at the 70th WHA in Geneva which wrapped up this week, Dr. St. John participated in the drafting group for the resolution supporting the document of which Appendix III was contained and she chaired the drafting group on the decision on the ‘welcoming’ of the implementation plan for the Report of the Commission on Ending Childhood Obesity. Dr. St. John has a long history with the WHO. In 2014 she spent 8 months as Senior Adviser for WHO, based in the UN office of WHO in New York in 2014. In 2012 she was appointed as Chairman of the Executive Board of the WHO, becoming the first Caribbean national to assume this position. She supported the co-facilitators of the UNGA review of the 2011 UNHLM on NCDs and in 2012, she chaired the drafting group which achieved the decision for 25% reduction in premature morbidity by 2025. At the 64th WHA in 2011, Barbados, Norway and Russian Federation were the original co-sponsors of the resolution which galvanised over 60 co-sponsoring countries towards preparations for the 2011 UNHLM. Within the context of the SDGs, Dr. St. John is a member of the Country Working Group (CWG) for the development of the Sustainable Health Agenda for the Americas (SHAA) 2018-2030. Dr. St. John was appointed to the post of CMO, in February, 2005. She is the top Technical Advisor on all Public Health matters on the island. In 2015, after 10 years as Barbados’ CMO, Dr. St John became the first female Director of Surveillance Disease Prevention and Control at CARPHA. In this capacity she had responsibility for the medical, environmental and drug testing labs; disaster preparedness and response; health security; surveillance; infectious disease and NCDs prevention and control; pharmaceutical regulation; and international health regulations capacity building. In late 2016, Dr. St. John returned to her post as CMO in Barbados. She was the Principal Investigator for several Cooperative Agreements with Development Partners and the National Focal Point for the International Health Regulations (2005). She has been a medical doctor for over 25 years and completed a Masters of Public Health in 1996 at the UWI Mona Campus, placing first in her class. Currently, Dr. St. John is the National Liaison Officer for the International Atomic Energy Agency (IAEA) for Barbados.